“I want to win the Champions League with Juventus,” Cristiano Ronaldo said in an interview with DAZN back in August. Following his summer move from Real Madrid – where the Portuguese star delivered the club game’s most prestigious trophy four times in the past five years – it was understandable that he would try to downplay expectations with his new side. Despite the Bianconeri dominating Serie A completely, CR7 wasn’t the only one tempering their ambitions. For the record, the bookmakers’ actual favourites are Manchester City (3/1 with Bet365), followed by Barcelona (9/2) and then Juventus (6/1). The Old Lady have won a league-and-cup double in each of the Coach’s four seasons in charge, their move to sign Ronaldo a clear signal that they were seriously targeting UEFA’s elite competition. In splashing out €112 million in transfer fees and an annual salary of €30 million, Juve were clearly thinking more about wins over Barcelona, Liverpool and Manchester City not Bologna, Lazio and Milan. Twice under Allegri’s guidance they have reached the final, only to be defeated by Ronaldo and Lionel Messi, now hoping that having one of that incredible duo in their colours should help them overcome the last hurdle. Those defeats in 2015 and 2017 mean that it has now been 23 years – and four losses in the showpiece event – since the Bianconeri last tasted Champions League glory way back in 1996. Could this be their year? They certainly have all the tools, with the impressive talents of Paulo Dybala, Mario Mandzukic and Douglas Costa supporting Ronaldo in attack. Behind them in midfield, Allegri has Miralem Pjanic, Blaise Matuidi and Emre Can at his disposal, while the backline of Joao Cancelo, Leonardo Bonucci, Giorgio Chiellini and Alex Sandro is among the best in Europe. 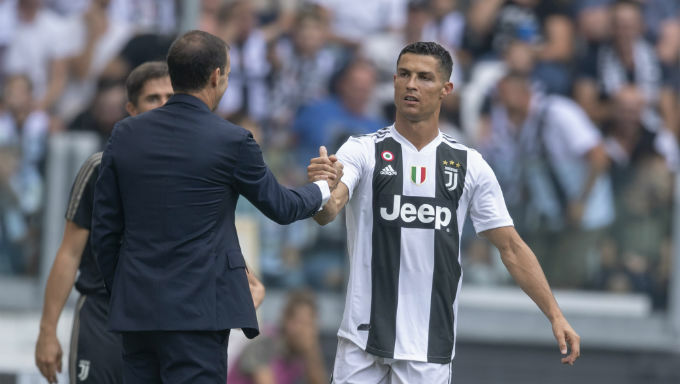 In terms of Coaching, Allegri has proven he can find a scheme to overcome any opponent, even picking up wins over Barcelona and Real Madrid in the knockout stages and Ronaldo certainly seems ready for the challenges to come in the New Year. "Now the beautiful part of the Champions League starts and I'm confident we will be fully ready for it," the 33-year-old told reporters after the Group Stage ended last week. Indeed, his scoring has been subject of some debate as a player who finished the past six seasons as the Champions League’s top scorer has found the back of the net just once in year’s edition. He will hope to rediscover his best against a very familiar last-16 foe, Juventus paired with Atletico Madrid in Monday’s draw. Against Atletico, Ronaldo has registered 22 goals and eight assists in 31 appearances in all competitions. That bodes well for helping the Bianconeri into the quarter-finals, and from there it is clear the Old Lady has the quality, talent and tactical awareness to prevail against any of their potential rivals. Given that they already have an eight-point lead at the top of Serie A and have won the last four editions of the Coppa Italia, those factors combine to make a treble a genuine possibility for the Old Lady. The odds on that happening have been dropping dramatically, starting at 300/1 at the end of 2017/18 but dropping immediately to 33/1 when the signing of Ronaldo was announced back in July. They have continued to fall, but those who still fancy Juventus to win the Champions League, Serie A and Coppa Italia can do so at 10/1 with Bet365 and that should be hugely tempting given their pedigree. Pavel Nedved certainly thinks so, as he explained to the Juventus website shortly after they were pitted against Atletico Madrid. “We have drawn the strongest possible opponent, but there is no problem,” the club Vice President said. “Cristiano may be the man of the Champions League, but the whole team is strong and we can be confident in our ability to qualify for the quarter-finals." No matter what they say in public, they’ll quietly be hoping for much, much more.